Immediate internal viewing is of paramount importance to fully appreciate this truly impressive and generously proportioned detached villa situated within the heart of this highly successful residential development by Bellway Homes which offers outstanding family accommodation throughout and further benefits from being located within easy access to Glasgow and beyond via both motorway and railway networks. 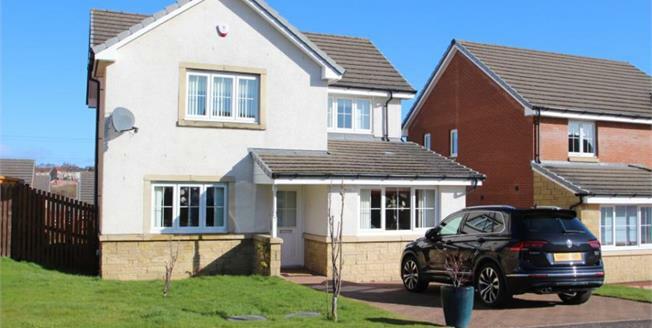 The property comprises reception hallway, cloaks/WC, formal lounge, sitting room (converted from original garage) fully fitted dining sized kitchen, utility room, upper landing, three generous bedrooms, master ensuite shower room and family bathroom. The property benefits from gas central heating, double glazing, twin car monobloc driveway and privately owned grounds to both the front and rear of the property with paved patio area and shed.